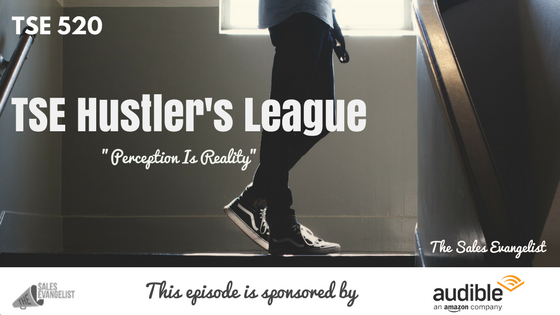 TSE 520: TSE Hustler's League-"Perception is Reality"
First impressions last for most people. Therefore, you have to make sure you establish a great perception. But, how can you create a great perception with your prospects and the people you’re working with? This is yet another great episode taken from one of the sessions of our online group coaching, the TSE Hustler’s League where we focus on a specific topic each week. This semester is all about building value. How do you want to be perceived by your prospects? This goes back to the concept of knowing who your ideal customers are. As you grow and evolve in your career, your customers may evolve as well into a more professional atmosphere. For instance, you may now be attracting customers who pay more. What are the things you need to project on your platform so people can see it? What are the most important things you can do to create that image of yourself which you want your customers to perceive you as? Make sure you look good. Identify the places which people will see you (LinkedIn, Facebook, Twitter). These people are going to look for you and they’re going to see you. So make sure you have that great lasting impression. Consider your appearance and look professional. Your choice of color is a huge factor too as well as the style of hair you wear. Bottom line: Make sure you look good. Make sure you have a good breath. Look good, smell good. Again, first impressions last a long time. You get one time to make a great first impression. Buyers will create a perception of you that’s going to last a long time. All of this will be based on the first FIRST impression you made. Your branding is what people think about you when you’re not around. And YOU are the brand. In order to set that perception, you have to clearly understand the person that you are and what you want them to see you as. Be careful with what you post especially when making political statements. Otherwise, make a separate social media account that is solely for business purposes.